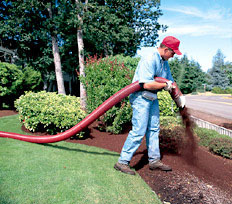 Crossroads Mulch - About Us - Contact us to learn more! Located in Southern California, Crossroads Mulch, Inc. is a leading provider of pneumatically applied mulches, playground wood chips and soil amendments. Our customers’ projects range in size from Caltrans Highway projects, to elementary school playground boxes and include City Parks, Landscape Contractors’ maintenance projects and new construction for commercial, residential, public and private projects. We provide and install Bark Mulches, Playground Loose Fill Safety Surfacing, Compost Mixes and Soil Amendments. Let us value engineer your project. When speed, efficiency and neatness are key to your project, our Express Blower service can’t be beat.